I doubt buying this mount to use with a C5 and an ed80, is it all metal? a lot of plastic? metal column? I plan to buy this mount for my C5. From what I've read, it should be able to handle it without a problem. A 80mm should also not be a problem. The mount can definitely carry 10lbs solidly. This mount works fantastic with a Stellarvue 80. I consider it a metal mount with a metal column. There is a plastic shroud on top of the mount but that makes sense. I look forward to getting my Celestron SE6 on it as soon as I upgrade the firmware or buy some rings for the SE 6 so I can keep my focus knob and red dot finder bracket in the proper orientation—right hand/left hand deal. It is definitely up to the task of a C5 and probably any 80mm f/7.5 or less. It can handle a 102mm f/7 (11 lbs with diagonal, eyepiece and MRF) very decently (pictured below). Yes, there are shakes at the focuser at higher powers but that is to be expected. The mount is mostly metal... with very little plastic... it feels like a solid mount with the metal. The general opinion of the mount here in the UK is that it is good and will take a bit more then the quoted 5Kg. That said what usually happens is people start steadily increasing and get worse results then complain. It takes the 80ED fine, I might try my 102 and see. Well the 102 didn't burn out the motors so tomorrow I will try the 127. Think technically it is termed "Destructive Testing". The first word is however somewhat relevant. As the weight it handles enables the Skywatcher 80ED that seems to be a good weight to stop at. There has to be a place to stop at. If you ran your car at 8000 rpm you would not really expect it to last long so why push a mount over its limits. If/when I get one (still awaiting delivery here) it will have a nice not heavy WO ZS61 on it. Add in that the latest firmware I believe allows you to set it to Equitorial operation and so people will almost immediatly add flatener and DSLR so that adds another 1Kg to the weight. but somehow DSLR weight gets forgotten. "I only had a 4Kg scope on it and the motors gave up. Everyone knows the DSLR, flattener, guide camera and guide scope all weigh nothing , don't they?" Edited by sg6, 22 July 2018 - 03:17 AM. Thanks for the comments, I just ordered one. How long will the 8 AA batteries last on a typical viewing session. I know this is subjective. I am looking for a rough estimate- one night, 3 nights or 3 hours. I have a small external battery that I can Velcro to the mount if the AAs are short lived. I've done one overnight trip with mine and got about 6 hours using Eneloop Pro NiMH batteries. At the end it still seemed to be motoring well but wouldn't hold the wifi connection. I didn't investigate further because I was tired, but very satisfied with the mount. That's with the Skywatcher 102mm Mak. New guy here. I've just received my mount and have it working. Using the SynScan Pro app. My most current android phone (Samsung S7 with android 8.0) sees the wifi on the mount but will not connect. Older phones and tablets will connect and operate the mount in AZ mode. The S7 asks if I want to connect in in AZ or EQ mode but will not connect in either. The older devices do not give a choice of modes. Are the newest shipped mounts coming with the new firmware or must I update the firmware? Are most of you updating the firmware and are there any reasons not to? I use mine with a couple of phones and have seen this problem, most often with my old HTC M8 which I keep for this purpose. My current HTC 10 also does the same thing sometimes, but less often. Anyway the only solution I've seen is to close the Synscan app, FORGET the mount AP, reconnect to the mount AP, and reopen the app. This usually works right away, but the other day it took about 4 or 5 tries with the M8. From what I've seen anytime it gives me the AZ or EQ selection, it's not going to work. When it works it connects automatically, no AZ/EQ selection needed. I'm still on firmware 3.10, which supposedly is AZ only anyway. I received my mount last Friday. The AZ-GTi mount goto was not tracking an object, unless you press "Point and Track." I'm running the SynScan Pro App Version 1.9.0 and was running the Motor Controller Firmware Version 3.10.A5. I upgraded the Motor Controller Firmware to Version 3.13.A5 (the right arm, AZ/EQ version). The mount still doesn't track after a goto unless I press the "Point and Track." This new version does seem to work fine with the telescope mounted on the right side. Kevin @ Sky-Watcher support is aware of this issue and said that he will let me know when a future release addresses the goto tracking issue. Regarding the connection issue, my Android phone (Motorola Moto G5) prompts me if I want to connect to the SynScan network even though there is no internet connection. If I don't click okay, then there is no connection from my phone to mount. You may want to look into this with your phone. I have had my mount out several times and couldn’t be more pleased. Quite a while back, I raised the issue of right and left hand OTAs and some people thought it was a joke. Has anybody changed the motor controller firm ware so you can use a Celestron SE 6 on the mount without turning it upside down? My mount works so well, I am afraid to upload the experimental software and make a mess of things! Perhaps the solution will be to get a set of rings and bar to allow me to use the SE6 on the mount as is. I received my mount last Friday. I'm running the SynScan Pro App Version 1.9.0 and was running the Motor Controller Firmware Version 3.10.A5. I upgraded the Motor Controller Firmware to Version 3.13.A5 (the right arm, AZ/EQ version). This new version does seem to work fine with the telescope mounted on the right side. I got about 3 nights or 6 hours from the 8 AA batteries. I now use the TalentCell 12V rechargable power supply, which works fine. It looks like I'll get several nights before having to recharge. Tracking Test: I centered Jupiter in the eyepiece and it took ~ 2 hours before it drifted out of the eyepiece. I was using an AT80EDT f/6 refractor and a Baader Zoom set at 8 mm (~ 68 degree AFOV). Mag ~ 60 and TFOV ~ 1.13. I was wondering how this mount gets orientated to be a right side scope mount? Just rotate the head and then the firmware knows that everything is backwards or something? I have decided to delay my purchase of this mount until September because the DC weather this year is extraordinarily bad with 90% of the days and nights since early May either heavy clouded or rain. Hoping this pattern clears out come late August when I can justify the mount. For now it seems it would just sit idle in my basement along with my other stuff while the wet weather runs ravage over the area. You need to upload a different version of the firmware to the mount. The firmware can be found on Skywatcher's website. 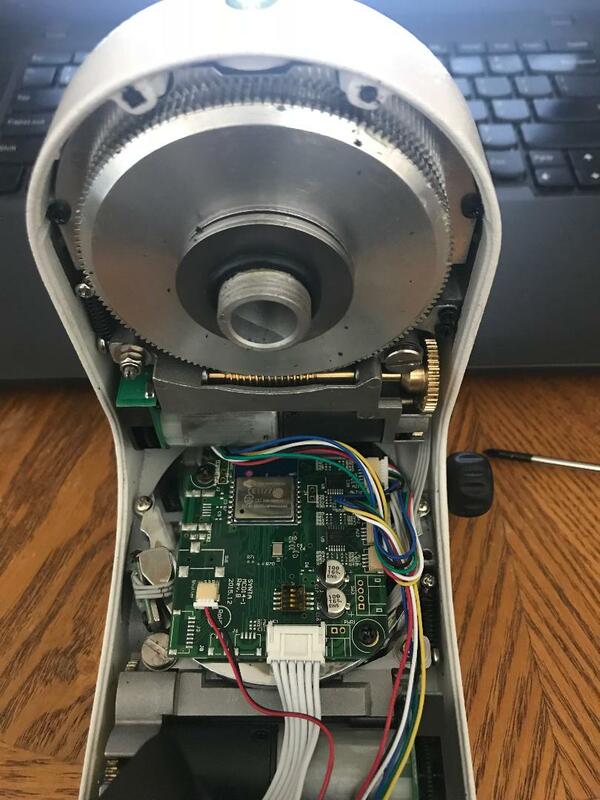 Yes, you'll need the updated firmware from the Skywatcher website and then just rotate the head so you can mount your telescope on the right side and all's well. Here are the internals of the AZ-GTi. Pretty nice for a mount at this price point! All of the important bits are either brass or metal instead of nylon! 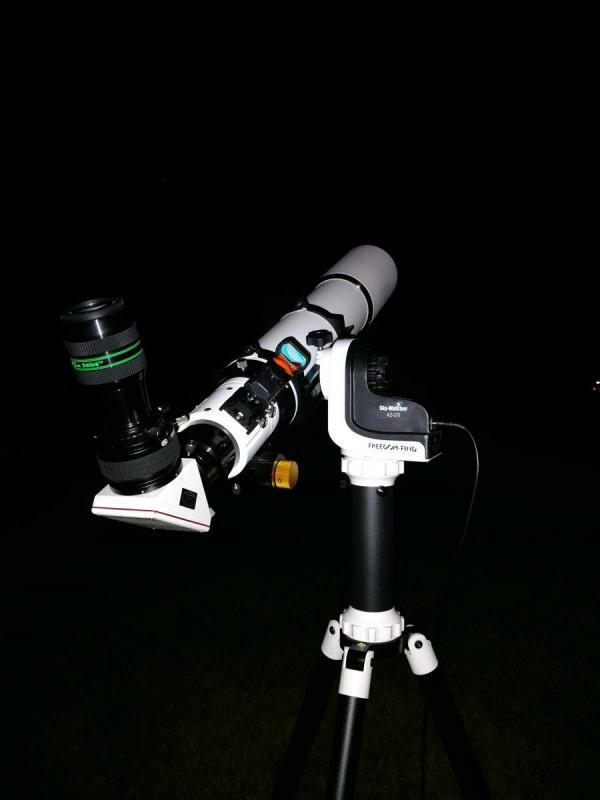 Is anyone using binoviewers on a small refractor with this mount, or would that become too much weight for it to handle? ...and how goes the solar tracking??? Has anyone actually used the AZ-GTi with a C6 mounted yet and can comment on how well it works? I bought mine mainly to use with a 102 refractor, although I'm finding myself actually enjoying the 102 Mak it came with. I've decided to try to do a trip to Chile this next year to see the southern sky before I have to see it from up close, so now I'm considering a C6 for that. I have an 8 Se and would love to have that with me but that's way more equipment than I want to try to haul via airline. DSO are my primary interest though and I figure a C6 might be more satisfying than either of the 102s. I think I should be able to fit the whole kit, minus tripod, into a one Pelican case. Have you considered a C5? Works great for DSO when paired with a focal reducer. Of course, the C6 will beat it in terms of aperture, but you cannot get any more compact than a C5 for size to aperture. I bought my AZ-GTi with the SW 127 Mak package and it tracks well with the red dot finder and a Celestron Zoom eyepiece (1.25"). I am running the mount on the standard tripod it came with but need to check if it works on a travel friendly Carbon Fiber tripod. Btw, I am also planning a trip to the Elqui Valley for the Solar Eclipse next year.... hoping to carry this as my portable visual setup as a carry-on on the flight. I've upgraded my firmware, I can connect with older android phones and on occasion with my S7. I did find that I had to turn off "power saving" mode in app settings. Is anyone able to use the EQ selection with the new firmware with an Android device? Yes I am able to connect in EQ mode on android. had to try couple of times to get connected to wifi itself.